Had a lovely evening with mary & bobby over last night, and I served this for dinner. 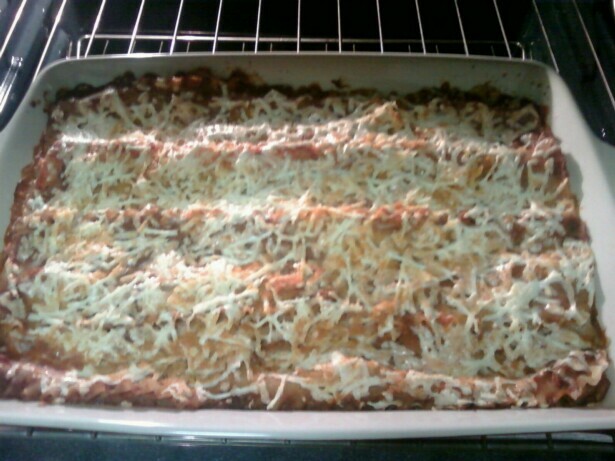 I will admit, this recipe is quite complicated and time consuming, but worth it if you want some decent vegan lasagna. (apparently bobby doesn’t even like lasagna, and liked this one! that’s what he said!) The last time I made this was when I was transitioning from vegetarian to vegan last fall, so I made some adjustments to keep it vegan. I had used rice cheese the last time (not vegan, contains milk protein) and this time I used Daiya. Thank goodness for Daiya’s ability to actually taste like cheese & melt. It’s flavor is a little on the sweetish side, so nutritional yeast seems to balance it out. 2 25oz jars of pasta sauce, store bought or homemade, RESERVE 1.5 c! Bring stock, liquid smoke and worcestershire up to a boil. Remove from heat and stir in TVP. Cover until ready to add to sauce. 1. In a large pasta pot or Dutch oven, heat olive oil to medium heat and add onion and sausage. Cook until onions are translucent. Add garlic, cook for an additional minute. 2. Add the wine and TVP. 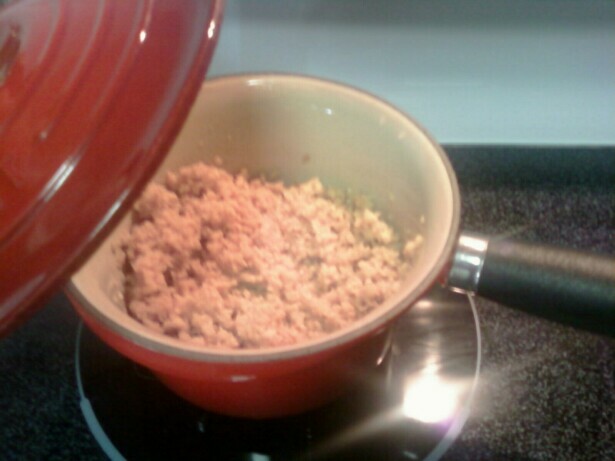 Scrape up any browned bits at the bottom of the pot and stir until wine evaporates, about 5 minutes. 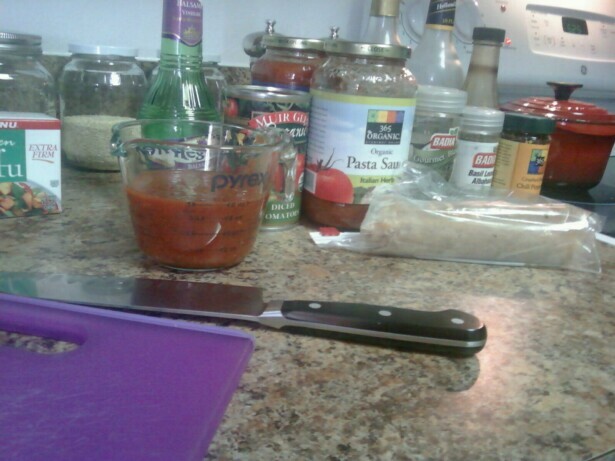 Add [all but the reserved] pasta sauce, and remaining ingredients. Reduce heat and simmer for at least 15 minutes. Directions: Combine all ingredients and set aside. 1. Cook noodles according to package instructions for al dente. Drain noodles, rinse with cool water, separate and set aside. 2. 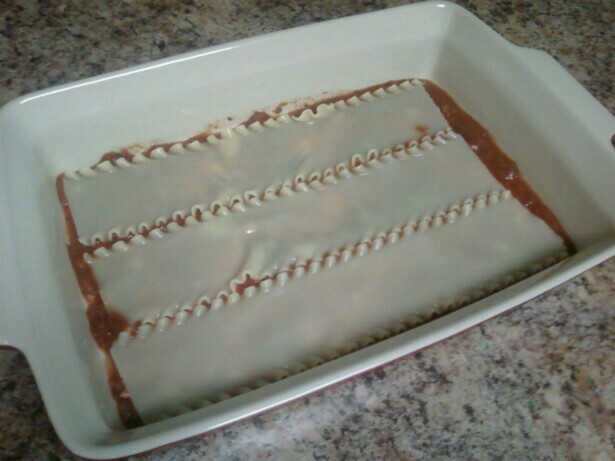 Spread a thin layer of reserved pasta sauce into a 9 x 13 baking dish to coat bottom, followed by 3 lasagna noodles. Spread half of the cheese & spinach mixture on top. Follow with half of the meat sauce. Repeat layers. Cover with last layer of noodles and the remaining reserved pasta sauce. Sprinkle remaining mozzarella evenly over top layer. Cover with foil and bake for 30 minutes. Remove foil and bake an additional 10 minutes. Let stand 10 minutes before serving. Bobby and I held a conference and came to a consensus. This is the best lasagna, vegan or otherwise, that we’ve both ever had.